Compost can be a great way to reduce your trash and sustainably produce your own fertilizer for your urban farm. Compost is both the process by which many gardeners manage the decomposition of organic matter and the end result of this process. You can find many different compost bins on the market today, or you can make one yourself. In an urban environment, the store-bought bin may be the best way to make compost without upsetting your neighbors. Composting is a process and some people don’t like the idea of seeing decomposing organic matter in their neighbor’s yard. A commercial bin is made from high-quality plastic, wood, or metal and is covered. For very small gardens, try the commercial compost tumbler that mixes the compost ingredients each time you give is a whirl. The ideal dimensions of your urban compost bin are 3-feet wide by 4-feet high. This is large enough to heat up and decompose quickly, yet not so large that it’ll be hard to manage. 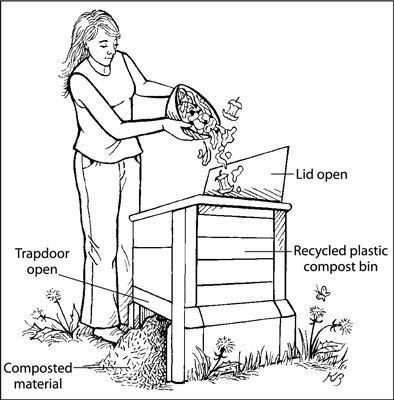 If you decide to make your own compost bin, you can do so by using wire cages, wood pallets, or wooden planks. Homemade bins tend to be more open and exposed to the environment, and the ingredients are more visible to you and your neighbors. They’re good to use if you have a larger yard, more space, and lots of material to compost. Brown materials are high in carbon and provide the long-term fuel to decompose all the materials in the pile. They include old hay, straw, dried leaves, sawdust, wood chips, and old grass clippings. Green materials are high in nitrogen and break down quickly. They jump-start the decomposition process in your pile and include fresh grass clippings, green weeds, kitchen scraps, fertilizer, and soil. Find an out-of-the-way spot to place your bin. Place your bin on soil, if possible, in part shade, but don’t hide it so well that you forget about it. Keeping it close to the kitchen is ideal because you’ll more easily remember to add the kitchen scraps. Add a 6-inch-thick layer of brown materials to the bottom of the bin. Add a 2- to 3-inch-thick layer of green materials on top of the brown materials. Repeat Steps 2 and 3 until you reach the top of the bin. Moisten each layer as you add it so that it’s moist but not too wet. Cover the pile to prevent it from drying out or getting soggy due to rains. After a few weeks, it’ll heat up and be noticeably warm. After it cools, turn the ingredients together, water, and let it heat up again. After a few months, when you can’t recognize most of the original ingredients and the pile is a crumbly brown texture, your compost is ready to use. How fast your compost finishes depends on the ingredients, the weather, and the amount of turning you do. You’ll get finished compost faster if you use shredded materials and the weather is warm than if you use bulky materials in the wintertime. If you prefer, you can simply build the pile and leave it alone without turning it. It will eventually decompose, but it’ll take longer and the final product won’t be as uniform. Experiment with the moisture. If the pile is too wet or dry, it won’t break down properly. Watch your brown and green ratios. If your pile has too much brown material, it won’t heat up properly. If the pile has too much green material, it may have a foul smell or get slimy. Make it the right size. A pile that’s too small may not have the mass to heat up properly. A pile that’s too large is unwieldy. Maintaining the right mix of brown and green materials is essential to making a good pile. Many urban dwellers accumulate little bits of kitchen scraps, grass clippings, and old plants throughout the year. Instead of just tossing them in the compost pile, keep them in a separate container. When you have enough to build a compost pile, add the right proportion of brown and green materials.